Craig y Cilau National Nature Reserve at Craig y Cilau Nature Reserve (NRW)0300 065 3000work Nature ReserveCraig y Cilau is of interest to the industrial archaeologist and landscape historian as much as to the naturalist. Quarrying for limestone which comprises the upper part of the cliffs has created a rocky and craggy environment to which the peregrine falcon has now returned to breed. Above the limestone escarpment is a capping of Millstone Grit and below the limestone are the sandstones, silts and clays of the Old Red Sandstone formation. The reserve therefore enjoys a very wide range of soil types which are reflected in the huge variety of flowering plants. Clinging to the ledges of the cliffs, out of reach of grazing sheep, there are five notable species of whitebeam, one of which is unique to this locality. In the shaded woody area on the lower slopes another rarity in this area is the alpine enchanter's nightshade, here at the southern limit of its distribution in Britain. The varied habitat from the scrub woodland on the lower slopes, up through the short limestone grassland and sparsley wooded cliffs to the open moorland of the summit makes this an excellent reserve for many different insects and birds. The cliffs are ideal raven country and the ring ouzel or mountain blackbird returns here each summer along with wood warbler amongst the trees and whetaear on the openland. The limestone itself is peppered with caves, and one of them Agen Allwedd is an important winter roost for lesser horseshoe bats. ACCESS : Open all times via a number of footpaths. Access to Agen Allwedd cave by permit only. TIME : There is a good half day's exploration here. NEARBY SITES: There is walking available over the common of Mynydd Llangatwg, beyond the limits of the reserve, including a footpath across the summit which drops down to Brynmawr. Here the Nantyglo ironworks was the main consumer of the limestone that was quarried. Other limestone went down tramways to the canal at Llangattock. The limekilns, where the stone was burnt to produce lime for fertiliser, have been restored along the canal. 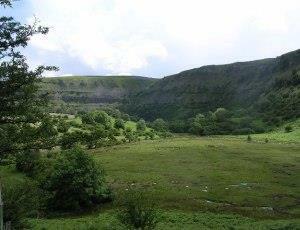 Craig y Cilau is of interest to the industrial archaeologist and landscape historian as much as to the naturalist. Quarrying for limestone which comprises the upper part of the cliffs has created a rocky and craggy environment to which the peregrine falcon has now returned to breed. The towpath of the Brecon and Abergavenny Canal makes a pleasant walk as it follows the southern side of the Usk valley. From the A4077 turn south through the centre of Llangattock, fork right at the chapel, over the canal and steeply up the lane for about 1.5 miles until you cross onto the unfenced common. Park tidily on the roadside, and head for the crags or take the public footpath first down to the foot of the reserve. Or approach from the east, parking at the old quarrying settlement of Pant-y-Rhiw.